Yes, that's me climbing again. The dress was red,a cute dress Mom bought for my first birthday celebration. Since the photo is dated March 1951 this climging event must have happened on, or shortly after, my birthday. My suspicion is, if mom tried to keep something away from me I would do my level best to get to it. As always, I am fighting the urge to change my focus and dive into new projects. Focus can be tough while reading blogs and hanging around Ravelry. Recently, I've been distracted by the beautiful sweaters and shawls knit by the Rainey sisters. Sally's wedding shawl looks ethereal (now I want to knit all of Boo's shawls) and Susan's sweater, Burr by Veronik Avery, with Susan's addition of contiguous sleeves, is simply inspiring. Even though I only watch a few forums on Ravelry my queue fills up quite quickly. Recently a Biscuit KAL was started on the Woolen Rabbit forum and it's all I can do not to cast on and join. Also, the Woolen Rabbit Club yarn arrived and with a gorgeous skein of red worsted that Kim dubbed Clara Bow. The name fits perfectly with the charming pattern by Amy Herzog, the Fellowes Cloche. 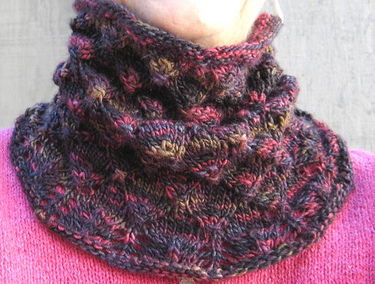 To make matters worse, Susan posted on the Knitting as Fast as I Can forum her new cowl pattern, The City Creek Cowl (and it's free!). I'm dying to start knitting so, stash diving or yarn shopping could ensue. While on a recent trip to a LYS I picked up a skein of Noro Silk Garden to make a tea cozy for my small, and daily used, 2 cup teapot. Knitting a cozy could be a nice diversionary tactic. But, focus must remain on my Chocolate Quill and Autumn Leftie, as well as my sweater swatch. I do not want my projects to become UFOs, a no-no around here. When it comes to knitting I do as Yoda advised, "Do, or do not, there is no try". This week I've felt whiny and tired with the added cherry on top of disappointment. It's been 10 weeks since surgery and I know there is no reason to be hard on myself. Every doctor has told me I'm doing better than expected, which is great news, but I still feel like "normal" is slow coming. The goal this winter is to get back in shape, but I'm fearful of the gym and all the people who touch the machines. There just isn't enough hand sanitizer to make me feel comfortable. Speaking of hand sanitizer, my knuckles are raw from using it every time I touch a public doorknob, grocery cart, or any other public surface. See how whiny I am? As Anne reminded me, I've been knitting bone 24/7. Too bad it doesn't count as a sweater. The perfect accompaniment to knitting Miss BB has been Lady Day and Ella Fitzgerald. I'm not singing the blues over this sweater, but the warm and rich tones of Billy and Ella enhance the way I feel. I love this sweater. The fabric, created by the color and pattern, sing to my soul. I'm completely crazy over this sweater and to prove it I gave her my undivided attention all weekend. When you're in love you can justify anything and I talked myself into monogamy of project by telling myself I deserved to knit what I wanted to knit. The blues are making me happy. 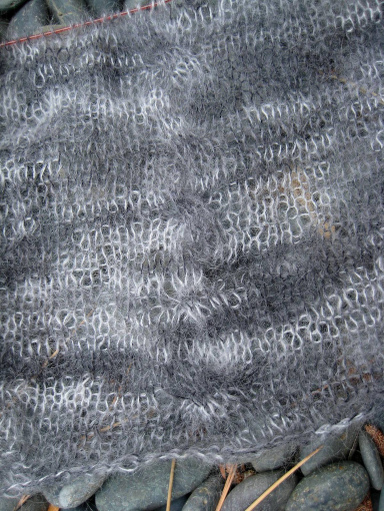 The stitch detail is nicely planned and is completely fun to knit. Bonne Marie writes her patterns well and I've only had one moment of incomprehension…totally my fault (or the surgeries fault). A good nights sleep and reading the pattern with a fresh brain gave me that "aha" moment. The little brain burps are happening less often. I'm in hope full power will be restored soon and that makes me happy. In any case, the pattern has been easy to memorize and, after quickly moving through the body, it is now time for the armscye decreases. Bonne Marie attention to detail and her pattern writing skills, make easy, enjoyable knitting. One of my pet peeves is when a designer has you cast on a row and then starts the pattern immediately. 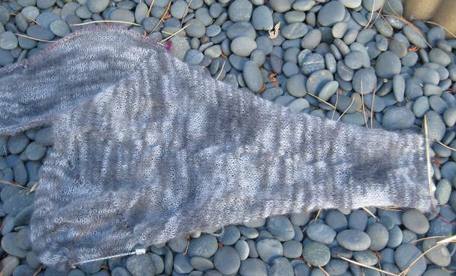 The cast on row (for long tail cast on, which is the most common) is the wrong side of the fabric. It's easy to see the purl bumps and unless the designer, or the knitter, pays attention to this detail the bottom edge isn't smooth and doesn't look finished. 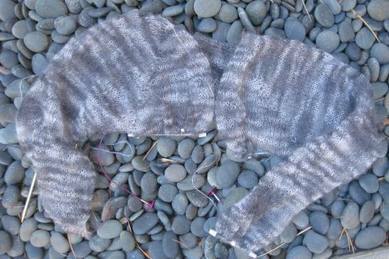 Bonne Marie pays attention to this detail and her designs have a nicely finished edge, a knit edge. The perfect little edging on my sweater makes me happy. I'm enjoying the blues, but not singing them. Miss BB is a dream come true. Maybe adding one more project to my already long list of WIPs wasn't the right thing to do. However, for the last two years I have successful completed NaKniSweMo , which runs through November, and wanted to give it another go. Doing so meant jumping into something I rarely do--starting a new sweater with one already on the needles. Another reason for knitting a second sweater was my growing bad attitude about Pas de Valse. My love of the process was slipping and I needed to figure out how to put it back on track. The difficultly was in my lack of vision, the inability to see the end of knitting sleeves in the round. If I couldn't find the right method for sleeve knitting the process would fail me. In order to keep on track with Pas de Valse I had to make a deal with myself…if I worked on the sleeves while at SnB (twice a week) I could cast on for Miss BB. The sleeves in the round aren't quite as daunting while visiting with friends and the process has been much more enjoyable. Thus, with the advent of Miss BB the attitude has taken an upward direction. The minute Miss BB came onto the fashion scene I knew it would be perfect for the Glacier Blue Beaverslide calling from the stash. I also knew it would be a great project for NaKniSweMo and for sweater #12 of NaKniSweMoDO09 . November 1st I cast on and quickly knit through the first couple of inches. It's going to be a great sweater and I love the yarns beautiful blue fabric. It's quite possible both sweaters will be completed by months end. If not, December will be used for any clean up. The goal is within sight! That's me, feeling like a powerful grrl who fought right on through any diversity and finished NaKniSweMo just in time! Empowered by sheer will, against all odds, I DID it!! Forced Encouraged to keep going by the likes of Kay, my fellow Ewe-tah grrls and you, dear readers, I stuck it out and made it all the way to the finish line. This lovely little sweater was pure product knitting...no enjoyable process involved. This diaphanous, delicate knit was very, very real and often misbehaved. While there was a bit of errata, the pattern wasn't the problem. It was the yarn...miles and miles and miles of tiny, fuzzy, ethereal and elusive FUZZ! And, its shades of gray didn't help the matter much. I do thank my lucky stars the sweater came out well in the end, but life (my life) is too short to ever knit with KSH again. It just is not my cup o' tea. Ladedadeda...YAY!! It's a very happy day. Can you tell? Let me just say, that Kay and Ann met their goal as I did knit (way) outside my lines. They had warned in the pattern that the yarn could be fiddly, but promised in the end that the finished product would be worth it. I'm just glad the sweater (and I) lived to tell the tale. You may have noticed that when things are not going well between what's on my needles and me, posting to the blog becomes a slog. The lesson learned this weekend was...it's all in your perception, and what you perceive may not be what is true. (How many times do I need to learn the same lesson over and over!?) It's all in the attitude! Every chance I had I've been knitting, just knitting and knitting without thinking about what I was creating. My reason was a good one, because if I gave it too much thought, my thoughts would turned to the negative, and I didn't want to go in that direction and speak ill, or think ill, of my knitting. If you can't say anything nice... (you know the rest). As it turns out, I was saved from myself by a few good things that happened along the way. The first thing that changed my attitude was a lovely new tea I picked up at the Tea Grotto (my favorite tea stop). It's a green tea flavored with pineapple chucks and mallow flowers (called Green Goddess) and it could not be more delicious. The flavor is sweet and delicate, which makes a perfect afternoon into evening refreshment. Having this tea as my companion made sitting with the slogging knitting all the more enjoyable. The second advantageous happening was an early Holiday gift, a gift I'm withholding information on to ensure there is good fodder for easy blogging over the long weekend. Suffice it to say its existence in my life has been a boon. The last development, and the best as far as knitting is concerned, has been the knitting itself! Last week, after spending a couple of days knitting the sleeves I realized there was no way to tell how long the sleeves should be without trying the sweater on. Now, one cannot try on a sweater that has no body, which meant I had to started knitting the body. All that going back and forth over so many stitches, set me off on a journey to the wrong mindset...the mindset of a slog. My bad attitude was the cause of cables missed, with other problems along the way and, after fixing mistake number 129, I realized an adjustment in the mental state was needed. The project sat in my lap as I worked and it was hard to tell if this gray mist of fluff, this shapeless, diaphanous entity could become something wearable, something that would fit. Sunday evening, just when my attitude seemed to reach its lowest point, I decided to slip the sweater on and see if it was feasible to continue. Was this perceived slog going to be worth the extra effort it would take to finish? As I slipped my arm through the mist of gray I caught a glimpse of its potential, I saw the light. This sweater had form, albeit compressed (for it will need a good blocking), plus it also seemed to fit (hard to tell, but certainly looked right), and not only did the sleeves look almost long enough, only a few more inches of knitting would be needed to finish the body! It was rather stunning to see and watch as hope grew and faith was restored. Now I can knit on, crisis averted. No knit should be a slog. I've said that to several knitters this past week, including myself. If it isn't fun, why are you knitting it? If it's a slog, and not working out satisfactorily, why are you knitting it? We could all use more time, especially more knitting time, so why are we so willing give up time to a slog of a knit. To digress just a little... If you need a quick gift, go buy something. It's unlikely the person your giving the gift to doesn't want your "quick" knit anyway. Few people love your knitting the way you do and very few will appreciate it the way you do. Something as cherished as time should be only be given with great discretion. This article in the Twist Collective says it better than I can. OK, I got a little off track. Let's go back to the "No knit should be a slog" bit. Just as Plan B (Ravelry link) was moving away from the hard to see increases and into the easy knitting of the body and sleeves, I made a tactical error. All that intuition and experience failed me and I hit a big bump in the road, a bump which nearly derailed the whole project. All the adjustments to start the sleeves were made when I suddenly had the brilliant idea to knit the sleeves in the round. 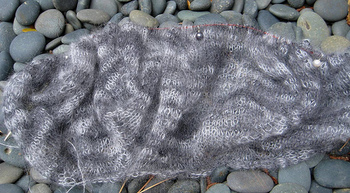 How cool would it be not seam them, to just knit round and round with the Kidsilk and be finished! Whee...it sounded great! HOWEVER, after purchasing the size 8 bamboo needles, and starting to knit the first sleeve I quickly saw the error of this decision. The yarn just isn't quite right for sticky bamboo and trying to handle four needles, the fuzzy yarn, a cable and the decreases (which doesn't sound too bad as I type) turned into a nightmare. The sleeve became a BIG OLD SLOG. I told someone that I officially hated this sweater and didn't know if I could go on. But, go on I must and when I sat down to slog on I knew, I just KNEW a change had to be made. Immediately I took out the needles and started rewinding the yarn row by row. It felt good, cathartic in fact, and before long I had the offending 4" rewound and the stitches back on the lovely Addi lace needle. The first row of back and forth sleeve knitting and there was no doubt it was the right thing to do. That evening the sleeve was nearly finished and there was no hesitation in starting the second sleeve. All is well in NaKniSweMoland. Let's hope this sweater photographs better when finished than it does now. On a happier note, the Forest Canopy Cowl in yummy Manos Silk Blend, color Java, is finished and I love it's softness against my neck. The pattern is very quick and fun to do. If you love someone very much, and you would like to give them something you've knit, this would make a wonderful gift. But, make one for yourself, too. 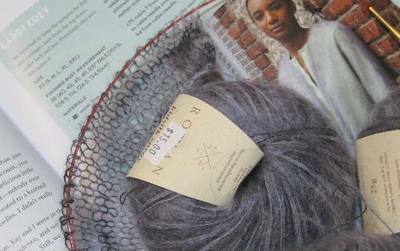 If a knitter wants a sweater in one months time, it's best to keep a few things in mind. A sweater knit at a large gauge will grow more quickly than say something on a size 2 needle. Use a yarn that is comfortable and lovely, one that your hands will love and that you'll love. Of course the main consideration is the pattern. Is it a time tested pattern, something tried and true with few problems to fix? Above all, check for errata to ensure there are few, if any surprises. 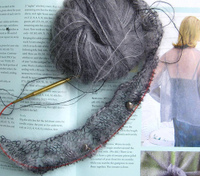 Input from other knitters is always a bonus (thank you Ravelry) and when you are ready to knit carefully read through the pattern and mark any changes that need your attention, such as size changes, increases, decreases, a change in needle size, or if it instructs "at the same time". A yellow marker, pencil and paper,stitch markers, stitch holders and other neccasary items should always be handy. Follow this advice and you'll be in the running to have the sweater finished in one months time. It's proven to be a good thing that I moved on to Plan B for NaKniSweMo. However, this seemingly simple cardigan has had its own issues from the beginning. I may not have followed my own advice when choosing this pattern. 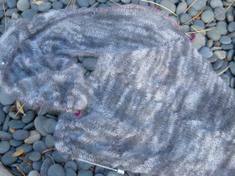 I did check Ravelry for errata and found many complaints and problems. In addition there was loads of advice and it seems errata was added daily for a time. Hope doesn't help a knitter much, but faith is active and requires participation. I have years of experience, dozens of classes and many finished items under my belt. That means my knitting intuition has been honed. I know when a project is worth the effort and when its a bust. I took the jump, acted on faith and went for it. Even though the pattern called for only 2 balls of Kidsilk Haze, I knew this was unlikely. I had 5 balls of my chosen yarn on hand so knew there would be no shortage if my intuition proved correct. Later this corrected amounts of yarn were posted and I have more than enough. I also saw a potential sizing problem as the finished measurements did not coincide with the schematic. This problem helped in my decision to knit a Small instead of the Medium size. Addi Lace needles have been a big help, as they keep the stitches tamed and under control and the yarn has been interesting to watch, as it changed from white to gray to charcoal. It has been a wonderful experience to knit with this yarn and it hasn't caused one minutes trouble. Even when I've had to rip back, it has behaved well. This knitter is pleased. To my advantage, the small size had minimal errata. However, the biggest problem has been the way the raglan increases are executed. Once I figured out that the YOs in the "K1 yo K1" increases needed to line up one top of the other, the increases fell into place. Reading them as if they were a lace pattern helps, as did stitch markers, but they are very difficult to see in the fuzzy haze of mohair yarn. Some of the pattern rows are not written out and the only way to ensure the count is correct has been to write them out for myself. Counting the stitches in each section (front and back) is critical...nothing should be left to chance. Knitting through row 19 was an exercise in patience and perseverance, but once past that point the pattern has been easier to follow. The beautiful, ethereal cables come out of nowhere and if they are not well marked a knitter could easily to forget about them altogether. Sadly, the do not show up well in photographs (and barely in the actual sweater). To make sure each cable is twisted on the right row, it has been best to keep a row count as I go. This sweater demands constant vigilance, consistent and accurate counting. Stitch markers are a must and there is no letting down ones guard, no easy mindless knitting. I am now knitting the sleeves (they are finished before the body, which is a good idea) and the rest of the project should be easy going (except for counting where each cables is twisted). I do expect this sweater to be worth the experience. Last night at 10:00pm it was 70 degrees. We had the windows open and could hear crickets chirping. It was likely our last warm night until next spring. Rain is on the way and we need it desperately.